Raft down the Grand Canyon. Shape environmental legislation. Climb the slopes of Mount Rainier. Collect algae in the Puget Sound. Survey the giant forests of the Pacific Northwest. Students visit Yellowstone National Park for the program Environmental Analysis to study the unique geological and microbiotic conditions in the park. Getting out in the field is easy when you have the field right outside the classroom. 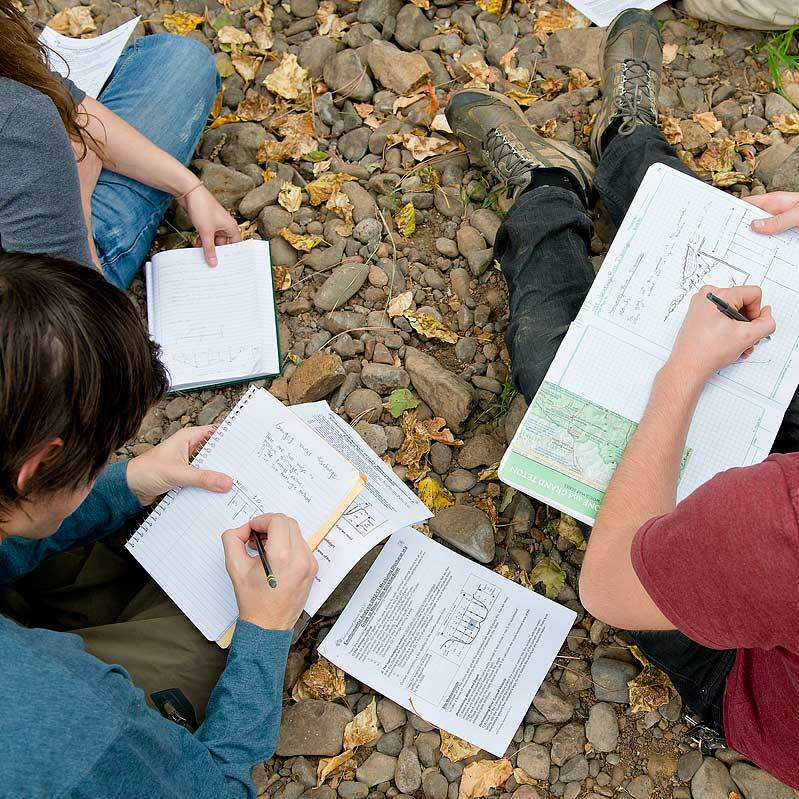 Students in environmental studies benefit from Evergreen’s natural learning labs: our 1,000-acre rain forest, open shoreline, and organic farm. Our location in Washington’s capital city makes getting involved in environmental politics easy. Students live and learn where policies are created. The surrounding community’s high level of environmental consciousness and the Pacific Northwest’s cultural and natural heritage form an unparalleled backdrop to your studies. Environmental studies offers introductory and advanced work in a wide array of laboratory and field studies that incorporate social sciences, environmental justice, biology, geology, chemistry, climatology, evolution, ecology, hydrology, and oceanography. You can also work independently with support through independent contracts, internships, and research. You’ll have the opportunity to work along with faculty in real-world research, publish papers, attend conferences, and develop new techniques to answer novel questions. The mixture of an interdisciplinary approach and hands-on research allows you to make a transformative impact. Ken Tabbutt talks about the geological structure of the cliffs in Yellowstone as Andy Brabban and Clyde Barlow hold a geological map. Due to Evergreen’s emphasis on interdisciplinary learning, you’ll experience many programs taught by multiple faculty. The Pacific Northwest’s cultural and natural heritage form an unparalleled backdrop to your studies. Learn to get your hands dirty in two globally important types of landscapes: forests and farms. We will split our focus between an introduction to forests and forest measurements in the Pacific Northwest and an introduction to agricultural systems and ecological agriculture. You will learn to do forest measurements, inventory carbon sequestration, understand ecological succession, and identify common trees. You'll gain hands-on experience working with our local trees in Evergreen's forest reserve. You'll also learn the structure and function of annual and perennial crop plants. Ecological agroforestry systems will be emphasized to show how perennial crops can bu used to optimize carbon uptake, efficiently use inputs, conserve soil, and maintain food production. Students in Restoration Ecology and Freshwater Ecology take a field trip to the Elwha River to study the effects of the Elwha Dam and how nature is recovering after its removal. Earning your degree with an emphasis in environmental studies prepares you for graduate studies and careers in the field. Our graduates are leaders in ecology, environmental health, natural resource management, conservation, forestry, wildlife biology, politics, economics, and global sustainability movements. You also have the option of continuing your studies with our Master of Environmental Studies. Christopher Sabine, director of the Pacific Marine Environmental Laboratory at the National Oceanic and Atmospheric Administration (NOAA), talks about the global carbon cycle, climate change, and ocean acidification. Students of all levels have access to science labs with a full range of equipment and high-tech tools. At the Organic Farm you can explore sustainable agriculture, agro-ecology, and environmental sciences. In addition to three acres of certified organic fields, the farm’s facilities include a food-grade laboratory, the student-designed and -built Organic Farmhouse, and the student-run Demeter’s permaculture demonstration site and Community Gardens. Evergreen’s 1,000-acre forest is ideal for studying a lowland Puget Sound second-growth rainforest. Through the Evergreen Ecological Observation Network (EEON), students and faculty conduct long-term scientific research. The college’s 3,300-foot shoreline offers a variety of ecosystems and natural features for students to investigate. Students do a titrations lab in the program Environmental Analysis. Students of all levels have access to science labs with a full range of equipment and high-tech tools. You can study some 27,000 specimens in the college’s zoological, botanical, and mycological collections. Evergreen’s campus is also dotted with a variety of teaching gardens. The Sustainability in Prisons Project trains inmates and correctional staff at local prisons to carry out ecological research and conservation projects. The program Picturing Plants went on a field trip to Mima Mounds Glacial Heritage Preserve to identify and draw native prairie plants. Students in Evergreen’s Master of Environmental Studies program organize this annual event. Experts speak on environmental topics such as local sustainability and climate change. The Sustainability House is a living/learning option for returning and transfer students. Residents commit to an environmentally conscious lifestyle, social justice, sustainable agriculture and activism. Gerardo Chin-Leo teaches undergraduate and graduate students, primarily in the area of marine science. He was named a National Academies Education Fellow for 2012–13. His research interests include marine microbiology, the ecology of phytoplankton with a focus on harmful algal blooms, and the ecology of bacteria as they relate to marine food webs and in anoxic environments. He earned a Ph.D in biological oceanography at the University of Delaware, where he also completed an M.S. in marine studies. He also earned a B.A. in biology from Reed College. Martha Rosemeyer teaches in the areas of ecological agriculture and food systems. Current research interests include creating a local sustainable food system and the science and culture of cooking. She has researched microbial ecology and nutrient cycling in traditional agricultural systems in Costa Rica and worked in reconciling nature and agriculture in the tropics and temperate Wisconsin. She earned her Ph.D. in biology from the University of California, Santa Cruz; M.S. in plant science from the University of Arizona; and B.S. in plant pathology from the University of Wisconsin-Madison.